CZ or EAA for bullseye? New guy here and am looking for a 45 to use for BE. Right now am looking @ CZ's and EAA's. Does anybody use these and if so which models? If not recommended, then why not? FWIW I'm considering the EAA witness elite limited so that I can get a 9mm slide/barrel for it also to use for other sports. Thanks and go easy on the new guy! Re: CZ or EAA for bullseye? Most of us started out with a 1911. The Springfield Range Officer is a great entry level 1911 for Bullseye if you are looking to try the sport out and there are several threads here discussing them. I got my Master Card with one. If you can afford a custom wadgun, that would be the way to go. Are you planning on shooting iron sights with your choices? They would probably fit well in the new Production category. Short answer, no nobody uses those guns for bullseye, reason, I doubt they would even shoot all 10 rounds in the black of the target at 50 yds, imo, if you want to shoot several sports and not excel in any of them then it really wont matter what gun you use but if your serious about any of them buy at least something that will have a chance at competing. I won't jump to the same conclusion about accurace on the EAA or CZ that DavidR does, but I do agree that starting with one of those isn't the best value. Just like sixftunda said, a Springfield RO in .45 for only $750 is ready to go for almost ANY competition, bullseye or otherwise. If you don't already own a .45, you have to try a 1911. There is a reason most shooters shoot 1911s for .45 stage...they are sweet. There really isn't anything better. I would never discourage a shooter with a CZ or EAA .45 from doing the best they can, but when you have a choice, .45 is the way to go, bar none. I've tested one CZ at 50. It did hold the black. There is excess play at the front lockup. It could likely be tightened. People will tell you not to do it, but if Brian Zins did it, the same people would buy one tomorrow. There are other designs that people are more familiar with accurizing. If the M9 can be made to shoot well at 50, so can the CZ. It'll just take time and money because very few guys are capable of the work. Sorry If my answer came off blunt, that's just my opinion, if your as good as B. Zins then maybe either of those will take you to national champion. Good luck with what ever you decide to go with. There is probably a good reason why Zins hasn't done it! Holding the black isn't good enough to give you the ability to call your shot - IMHO. On the other hand, the folks who accurize 1911's and M9's aren't bashful about posting results. There is one good part about the new "production" classification rules. We will get those shooters who have those HKs, Sigs, and Glocks to show up, and we are going to be able to see what those guns are capable of. I'm going on record that most of these modern guns are capable of 4" or even 3" groups at 50 yards, and this discussion is a lot about nothing. The 1911's have a lot of support from manufacturers and private pistolsmiths. There are an abundance of after market parts, including match quality barrels, bushings and pre-prepped trigger systems available. The pistols you mentioned don't currently have that array of aftermarket parts or support. I am not a fan of EAA as a company. With the choice between the two, I'd go with CZ. Although the designs are similar and the EAA pistols seem solid, in my experience, CZ is far more customer friendly. All that being said, I'd go with what is behind curtain 3, a good quality 1911. 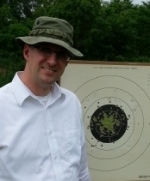 Well, there's nothing like an actual accuracy test at 50 to determine the suitability of a non-1911 .45 for Bullseye. I haven't yet settled on a load to test at 50 from the SIG, but I can tell you that it has always held 2 inches or better with Winchester White Box and one Hornady 115-gr XTP load. Not so good with 115 FMJs, even Sierras, and some 124-gr lead loads from before I realized the mould was cockeyed did 4.5 inches at 25. !!!YUK! RCBS took care of me as is their well-earned reputation and I cast some more last night...So we'll see if the next ones do any better. That said, I followed the NRA/American Rifleman testing of new pistol models up until a few year ago, and there really aren't very many box-stock semiautos that are likely to do better than 4 inches at 50 with even the finest factory ammo available. Given a few more tools than I have now, I could take a crack at accurizing HKs, SIGs and others, but I would still be reluctant to do them with stock barrels without first seeing some results of barrel fixture testing--at 50. American Handgunner ran a test of quite a few .45 barrels from various custom/match barrel makers maybe 10-15 years ago, and almost ALL of them as just a machine-rested barrel could easily hold 2 inches at 50 if I remember correctly. Interestingly enough, the EDM-rifled barrels were NOT as tight as any other type. So, if the barrel can hold 2 inches or less at 50, I'm pretty confident that properly fitting it in the slide, and having a decent slide-frame interface that does not interfere with that, I'm pretty confident the whole pistol can be made to hold 3 inches or better at 50. Just don't accuracy test your chosen Rebel Gun at 50 with cheap commercial lead reloads or ammo with plated bullets. Go with what's proven here, like the Hornady or Zero 230-gr FMJs. You'll have to ask others about 200- and 185-gr bullets/factory loads because I cast my own SWCs that barely hold 3 inches at 50 out of two 1911s.